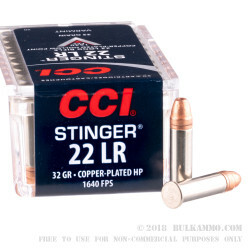 Whether it's plinking with your SW22 Victory or taking tree rats with your Ruger 10/22, you'll find few rounds greater than CCI's Stinger loads. 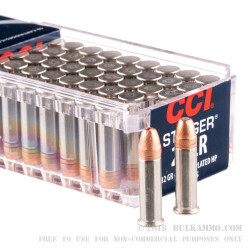 Each of these .22 Long Rifle cartridges is assembled using a factory-rolled, brass rimfire casing with a sensitive primer mixture at its base; CCI's primer compounds are made to be non-toxic yet sensitive to firing pins of differing design and striking angle. 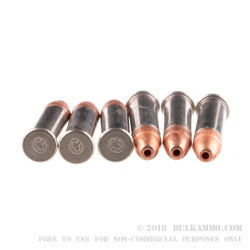 The case houses a high-energy powder, which produces a muzzle velocity of 1,640 feet per second with a 32-grain copper-plated hollowpoint (CPHP). 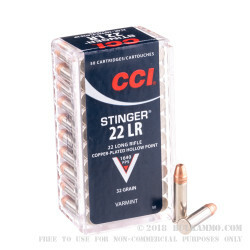 32 grains is a light weight for the .22 LR caliber that excels at varmint hunting. The projectile possesses an enlarged bourrelet which makes greater contact with rifling in order to yield excellent spin stability; this combines efforts with the protective copper plating and results in wonderful accuracy on target. Upon contact with a hare or groundhog, the bullet's hollow tip will cause it to expand, yaw, and create a larger wound cavity which helps to bring down game targets humanely.